Rupali Bank Jobs Circular 2018 will be Published Soon. Rupali Bank Cash Officer Exam Date Published and MCQ Result can be download here. Rupali Bank Jobs Circular 2018. Bangladesh Bank Author their official has been published Rupali Bank Requirement Notice 2018. As a result, found this career opportunity of my website. So if you want to get Rupali Bank jobs all updated information you can see here. We also will be found Rupali Bank Job exam date, exam seat plan, Exam result and more. Recently they are published Senior Officer post job circular 2018. Rupali bank is the government bank of Bangladesh. So if you want to build your career Government Bank. You can try this circular. We given all information of this circular. Rupali Bank Career Requirement published 17 July 2017 and apply will end 31, July 2017. Total 332 Number of Senior officer empty post has been taken this circular. So if you want to get this job try to our website we have given all information this job. When will be published junior officer , officer junior officer cash, post jobs circular we published here this circular Now we are given bellow this job important information. Master’s Degree from Any recognized university / Four-year (Hons) degree or equivalent can apply if. At least One student in the first class/category must have, can not be a third category. Applicants must be proficient in computer. Age: April 1, 2016, candidates on the 30-year-old should be. Freedom Fighters children 32 years of age and disabled candidates. Application rules: Online Bangladesh Bank website (erecruitment.bb.org.bd) must apply through. This circular is the senior officer post. When will be applying this jobs circular please see circular carefully? Here we have all updated information of Rupali Bank Job Circular 2018. You can apply our website. Here we gave apply Apply method and link. So you can apply easily this website. Af first goes our apply link and click them. After the click, you can get an applied form. Those who have previously applied for a public bank cannot meet their new form. Then can apply User Id and password. Rupali Bank Cash Officer Exam Date has been published. Exam date will be found Bangladesh bank Official website. Same time we are given this information here. As a result, you can download your exam seat plan this website. You also will get all updated information about this job. When will be published junior officer Circular, officer circular, junior officer cash, you can get information this. After download admit you can get exam dated. We will be given admit download option. 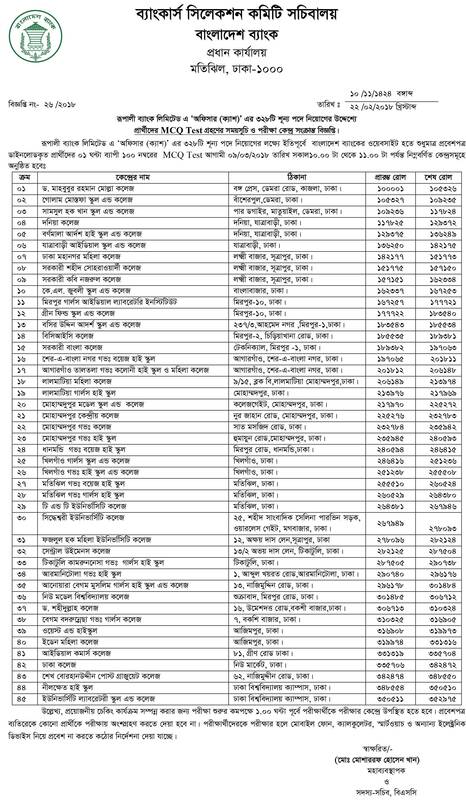 So you can download your Rupali Bank Job Circular 2018 admit. Here you can get exam date. Then you need the User id and password. But if forgot your user id and password go to this link. You can download your admit. End of your MCQ Exam you will be informed of Rupali Bank MCQ exam result 2018 will be found here. The Rupali Bank Exam result 2018 will be published after the end of the exam. Rupali bank their official website and our website same time will be found MCQ exam result. So as soon as you can download your MCQ Exam result here. After published MCQ exam result we are found Written exam dated. Who qualify MCQ exam can attend written exam. So you can get this written exam dated here. As a result, you can download your written exam dated. After exam of written exam, you can download your exam result here. You can get your result this page. If you get your exam result first visit our website regular after an end of the exam. Senior officer job exam is the very challenge of any exam. So if you want to qualify will be written you will be taken good preparation. For this, you read many jobs book and we published job preparation of our Facebook page. You can take some information for your preparation. You can take information of newspaper, Magazine and more.